This year's Macy's Thanksgiving Parade was pretty boring, so the internet resurfaced this terrifying classic from 1997. Over in the US, it’s currently Thanksgiving, an annual holiday which dates back to a 16th-century feast shared between New English Puritan settlers and Indigenous peoples — before colonisers decimated the land and relentlessly slaughtered Native Americans as they spread further and further west. As far as we can tell, Thanksgiving is now mostly a tradition where people eat Turkey and trash talk their racist uncle online. There’s also The Macy’s Thanksgiving Parade, where giant balloons float through Manhattan and people like Rita Ora sing on a float to promote their new album, Phoenix. 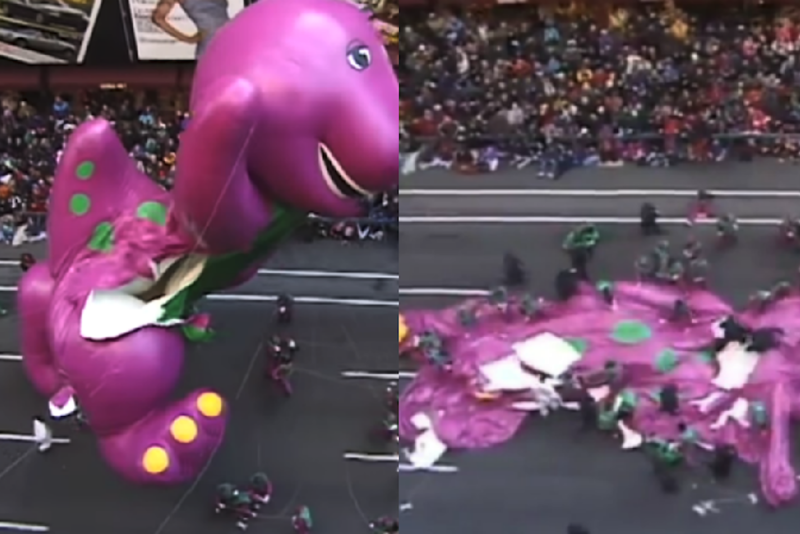 This year’s parade hasn’t been terribly exciting, but that doesn’t really matter, because Twitter user @TanookiKuribo has re-surfaced terrifying footage of the 1997 parade, where supremely intense winds tore apart a giant Barney balloon. You remember Barney? That loveable purple dinosaur you owned a plush toy of as a child, the one you held tight after your parents told you they were getting a divorce? The Barney that absorbed so many of your tears that it was, genetically, part of you? Ah yes, Barney. Well, Barney had a bit of trouble 21 years ago. At Broadway and 51st Street, your boy hit a wind tunnel, and the 30 balloon handlers struggled to hold on, some losing their wires completely. After a frantic few minutes, he is thrown around relentlessly and tears, bleeding helium in front of thousands of screaming spectators, not to mention the millions watching at home. As someone near the camera astutely points out, “this will give kids nightmares”. Police ran in to help as the dying dinosaur was lowered to the ground, stabbing it in mercy. Twitter user Rachel Millman says they were there as a child and saw a cop run towards Barney with his gun out, which is terrifyingly dumb. Barney’s death wasn’t the only issue in 1997: extreme winds caused The Cat In The Hat balloon to careen into a lamppost, which flew through the air and put a woman into a month-long coma. Years later, she was awarded a multimillion dollar settlement with Macy’s and the city of New York. For the record, 1997’s traumatic parade prompted some major changes to the parade’s rules. Balloons now can’t fly in winds above 37 km/h, or gusts reaching 54 km/h. Barney, your death wasn’t in vain. Vale.